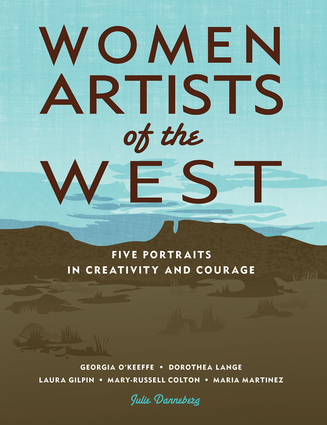 Through reading about these five important women artists of the West, we not only learn about the life of each individual artist, but also get a glimpse of a different side of the American West not often depicted in the work of prominent male artists. Through Maria Martinez we learn about the ancient Pueblo art of pottery making. Georgia O’Keeffe’s paintings show New Mexico’s landscape in vivid, lively colors. While Laura Gilpin’s photographs capture the peacefulness of the West’s wide open spaces, Dorothea Lange’s photographs document the suffering caused by the Depression and WWII. Mary-Russell Colton not only captured the scenery of Arizona in her oil paintings, she helped create the Museum of Northern Arizona, thus preserving the artistic tradition of the Hopi and Navajo. Each biography serves as an introduction to the individual woman and her art, as well as the time, geography, and culture where that art was created. For each artist, the chapter’s focus is on the time period leading up to her greatest work, the time when success was a dream and she was involved in trying to make that dream come true. Women Artists of the West features a unique first- and third-person narrative that allows readers to get to know the women through their actions and thoughts, as well as the observations and opinions of those who knew them. Although the dialogue is invented, all of the dates, places and event are factual. Sidebars give additional factual information and a bibliography is included in the back.